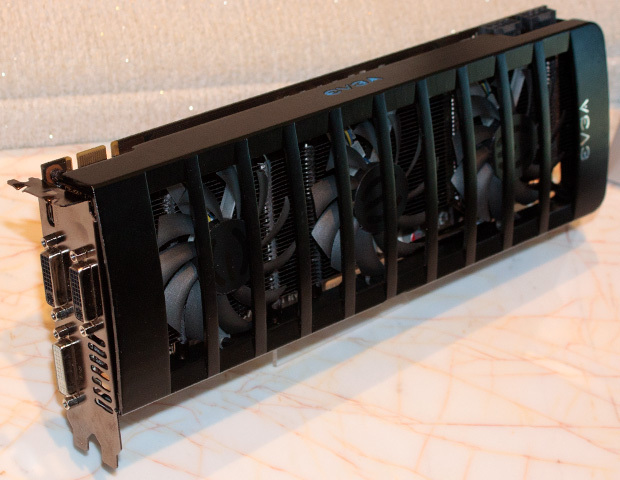 EVGA Showcases its Geforce based Dual GPU Monstrosity at CES 2011. EVGA showcased a new unnamed GPU based on Dual Geforce Based Chips at its CES 2011 booth. The company didn’t gave on any details on the card but its likely to be based on two of the current Geforce 500 Series chips which could either include the upcoming GTX 560 or the current GTX 570 chip. One amazing thing which can be noticed in the pics is the Huge Custom Heatsink which the card will use which offers a Unique design and equipped with three cooling fans which cool the Aluminium array Heatsink below which is pretty much visible. The cooling may look quite alot but for a card which uses two 8 pin pci-e connectors it isn’t. So much power means that the total TDP will be around the 375W region making it one hell of a card in temps and performance. Of Course! The Extra Juice will allow room for more overclocking. The bottom of the card has also been captured which reveals possible specs of the cards, It is supposed to feature a total of 1GB GDDR5 VRAM and holds two GPU cores, each with four memory chips. Dual Chips will make the card a bit longer than the current 500 Series Geforce cards. The card comes with 3 DVI ports making it 3D Surround Ready. Nvidia is sure planning on something for the upcoming Dual Antilles based card from AMD and this might be its real competitor, Pricing and Availablty are not confirmed but more news to be out real soon.